To Gallia on the "Ships starting with G" page. Manager: The Texas Company (Norway) A/S, Oslo. This company was controlled by The Texas Co., US, and its ships managed by Haakon Chr. Mathiesen, Oslo. Tonnage: 9968 gt. Remeasured during the war and by 1945 she was 9974 gt. Machinery: Two 8 cyl. 2T single acting DM (MAN, Augsburg), 5100 bhp. Delivered on June 20-1939 from Deutsche Werft A/G, Hamburg, Germany. Captain: Reidar Henriksen, from Apr.-1941 until 1953. He had previously served on M/T Germania (renamed India), M/T Nueva Andalucia and M/T Skandinavia. Guestbook message from the daughter of one of the crew members, Egil Melsom. Gallia was mostly in service New York/Halifax-U.K. with petrol, and with aircraft on deck, often as Commodore ship(?). As can be seen below, she also made some Mediterranean voyages. By the spring of 1944, she had made 50 North Atlantic crossings and had transported 330 000 tons petrol to the U.K. King Haakon VII and Crown Prince Olav visited the ship while in an English port, and on that occasion 3 men on board were awarded medals, namely 1st Mate Kåre Hjalmar Vøllen, Radio Operator Finn Ove Andersen and 1st Engineer Barthold Seines. Assistant Egil Melsom and Captain Henriksen already had the same medals. This info was found in Issue No. 4/1975 of the Norwegian magazine "Krigsseileren", which says they were given the "Olav's Medal". I thought this might be an error and should perhaps be Krigsmedaljen(? ), but the daughter of Egil Melsom has told me in her Guestbook message above that her father did receive the St. Olav's Medal w/Oak Branch, follow the link to the Guestbook for more details. All the Norwegian war medals are described and pictured on my War Medals page. 1940 Jan. 13 New York City Downs Febr. 9 Independent Mined at anchor in Downs. May 11 Southampton   OA 146 Dispersed May 15. July 20 Milford Haven   OB 349 Romped July 24. Sept. 11 Key West Sabine Bar Sept. 15 KH 402 Key West to Sabine Bar. Oct. 24 Liverpool New York City Nov. 10 ON 141 Convoy will be added. Nov. 21 Key West Sabine Bar Nov. 25 KH 420 Key West to Sabine Bar. Nov. 29 Sabine Bar Key West Dec. 3 HK 122 Sabine Bar to Key West. March 22 Key West Sabine Bar March 26 KH 458 Key West to Sabine Bar. March 31 Sabine Bar Key West Apr. 5 HK 164 Sabine Bar to Key West. May 5 Milford Haven New York City May 22 ON 182 Convoy will be added. June 15 Milford Haven New York City July 1 ON 189 Convoy will be added. July 31 Liverpool New York City Aug. 13 ON 195 Convoy will be added. Sept. 9 Milford Haven New York City Sept. 24 ON 201 Convoy will be added. Oct. 18 New York City Avonmouth Nov. 2 HX 262 Convoy will be added. Nov. 6 Milford Haven New York City Nov. 22 ON 210 Convoy will be added. Tunis to New York via Casablanca. May 4 Belfast Lough New York City May 18 ON 235 Convoy will be added. July 13 Augusta Algiers July 17 MKS 55 Augusta to Algiers. July 22 Algiers New York City Aug. 8 GUS 46 Algiers to U.S.A.
Oct. 23 Casablanca Fayal Oct. 27 GUS 55 Casablanca to Fayal. Nov. 5 Fayal Philadelphia Nov. 18 GUS 56 Fayal to U.S.A.
Jan. 28 Hampton Roads Algiers Febr. 14 UGS 71 For Algiers. March 24 Hampton Roads   UGS 82 Passed Gibraltar Apr. 7. June 11 Baltimore Antwerp June 28 Independent Via Falmouth. Only a selection of her convoy voyages are mentioned in this narrative - mostly her Trans-Atlantic voyages. For info on voyages made in between those noted below, please see the archive documents and A. Hague's Voyage Record above. Follow the convoy links provided for more details, the Commodore's notes and/or narrative are also available for most of them and several Norwegian ships took part. On Febr. 9-1940, Gallia was moored in The Downs for a British contraband check when a drifting mine blew a large hole in her bow on the port side. 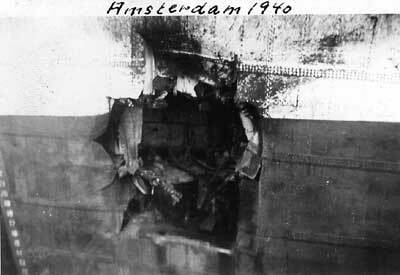 She stayed afloat and continued to Amsterdam with petrol, paraffin and diesel oil and was repaired there after unloading. This is what Gallia looked like after the encounter with the mine. The picture was taken by Egil Melsom, and was sent to me by his daughter, Diana Melsom McDonald. Egil Melsom was on board from June-1939 till March-1947, and also sailed on other Norwegian ships. Here's Diana's Guestbook message. Gallia departed Amsterdam again on March 12, heading to the U.S. According to Page 1 of the archive documents, she was on her way from Port Arthur to New York when war broke out in Norway on Apr. 9-1940. From New York, she proceeded to Halifax, and on Apr. 22, she joined Convoy HX 37 from there (this is the date the Norwegian government requistioned the Merchant Fleet - there's more on this on my page about Nortraship). Gallia arrived Falmouth on May 3, later continuing to Southampton, with arrival there May 5. She subsequently returned to the U.S., having joined Convoy OA 146, which originated at Southend on May 11 and dispersed May 15, Gallia arriving Port Arthur on May 29 (Vestland is also listed, but was only bound for Barry - see the external link provided within the Voyage Record above). In June, I have her in Convoy HX 49, in which Eli Knudsen and Randsfjord were sunk - follow the links for details. Gallia was bound for Southampton with gas oil and joined with the Bermuda portion. She arrived her destination on June 28, having sailed from Bermuda June 8. We now find her in Convoy OA 176, which started out in Southend on June 29 and dispersed July 2 - again, see the link in the table above. Gallia's destination is not given, but from the archive document, we learn that she only went as far as Plymouth, where she arrived on June 30, heading back to Port Arthur on July 8, arriving July 25. A. Hague says this voyage was made independently. From Port Arthur, she had continued to Halifax already the next day, arriving Aug. 4, and was scheduled for Convoy HX 64 on Aug. 8, but did not sail. There's a note in the original Advance Sailing Telegram for this convoy saying "to be held at Halifax", and she does not show up in an HX convoy again until HX 71, which left Halifax on Sept. 5 and arrived Liverpool on the 20th; Gallia, cargo of petrol and paraffin, stoppepd at Belfast Lough that day. It'll be noticed, when following the link to my page about this convoy, that the Bermuda portion only is currently available, but the rest will be added. For now, please see A. Hague's listing for HX 71 at ships in all HX convoys. Laurits Swenson, Polartank and Titanian are also included. Gallia is also listed as bound for New York from Belfast in ballast in Convoy OB 221, which had originated in Liverpool on Sept. 29 and dispersed Oct. 3, Gallia arriving New York on Oct. 12 - again, see Page 1. Solfonn and Torvanger are also listed in this convoy, which is available via the links in the table above. Gallia later returned to the U.K. in the Bermuda portion of Convoy HX 88*, having sailed from Bermuda on Nov. 12 (convoy originated in Halifax on Nov. 14 - Ferncastle is also included). With Alaska and Torborg (returned), she's now listed, again with destination Port Arthur, in Convoy OB 255, originating in Liverpool on Dec. 7, dispersed Dec. 10, Gallia arriving her destination on Dec. 28 (link in Voyage Record). On Jan. 11-1941, she can be found in Convoy HX 102 (having been cancelled from the slow Convoy SC 19). She headed back to Port Arthur again in March, but according to A. Hague, she did not sail in a convoy. She was scheduled to return with Convoy HX 120 from Halifax on Apr. 10, but did not sail, and was also cancelled from the next convoy on Apr. 16, HX 121 (Caledonia was sunk - follow the link for details). As can be seen when going back to Page 1, as well as the Voyage Record above, she did return to the U.K. that month, but made this voyage independently as well (according to A. Hague); she arrived Swansea on Apr. 28, having left Halifax on the 15th. In May, we find her, along with Harpefjell, Høegh Scout and Thalatta, in Convoy OB 320, which originated in Liverpool on May 8 and dispersed May 14, Gallia arriving Galveston on May 27 (link in Voyage Record). In June, she's listed in the Bermuda portion of Convoy HX 135, bound for Avonmouth with gasoline. Her voyages in this period are shown on Page 2. With Benwood, Gard, Lise, Thode Fagelund, Tore Jarl and Vav, she later joined Convoy OB 349, originating in Liverpool on July 21-1941, dispersed Aug. 1, but according to A. Hague, Gallia had already become a romper from the convoy by then and arrived Port Arthur Aug. 8. She headed back to the U.K. on Aug. 21 in station 73 of Convoy HX 146 from Halifax, and arrived Avonmouth Sept. 10. About a week later, she joined the westbound North Atlantic Convoy ON 17, which was dispersed Sept. 29, Gallia arriving Houston on Oct. 10. On Oct. 22, she appears in Convoy HX 156 from Halifax to the U.K. Eglantine and Montbretia were among the escorts for a while. Gallia went in the other direction again on Nov. 13 with Convoy ON 36 (station 54). She arrived New York on Nov. 30, the convoy having been dispersed a few days before. Montbretia and Eglantine are again named among the escorts; see also the Commodore's narrative. Her last Trans-Atlantic voyage that year was made in Convoy HX 164 from Halifax on Dec. 8, together with Polarsol, Norsktank, Hilda Knudsen, Kaia Knudsen and Leiesten. Gallia arrived Avonmouth Dec. 29 (Page 2). She returned across the ocean with Convoy ON 54*, which originated in Liverpool on Jan. 6-1942, dispersed Jan 17 and also included Brant County, Daghild, Fenja, Haakon Hauan, Leiesten (returned) and Lise. Gallia's destination is given as Aruba, but from the archive document mentioned above, we learn that she arrived Philadelphia on Jan. 24; Aruba is not mentioned. According to Arnold Hague, she subsequently joined Convoy HX 173 from Halifax on Febr. 1, arriving Avonmouth Febr. 16, returning to the U.S. later that month with Convoy ON 71*, originating in Liverpool on Febr. 26, dispersed March 8, Gallia arriving Galveston on March 20. She had again been in the company of several other Norwegian ships, namely Athos, Fagerfjell, Fjordaas, Garonne, Høegh Giant, John Bakke, Malmanger, Skaraas, Solfonn and Velma, as well as the Panamanian Norvik (Norwegian managers). On Apr. 25, she rescued 1 merchant seaman and 5 of the 10-man Armed Guard from the U.S. freighter Otho, sunk by U-754 on April 3. 23 of the 36-man merchant complement, 4 of the 10-man Armed Guard and 4 of 7 passengers died (source: Robert J. Cressman - see also the external link provided at the end of this page for more information). According to "Tusen norske Skip" by Lise Lindbæk these survivors had spent the 22 days on a raft, and were too exhausted to move when they were found, so that 2 men from Gallia had to jump overboard in order to save them. From Page 3, we learn that Gallia was on her way from Bermuda to Halifax on that date, in order to join Convoy HX 188 on May 3. Later that month, she joined the westbound Convoy ON 97*, which left Liverpool on May 22 and arrived Halifax June 5; Gallia, however, was bound for New York, where she arrived June 7. B. P. Newton, Brant County, Brimanger, Cetus, Norfjell and Nortind are also listed, as is the Panamanian Norvik. Gallia's subsequent voyages are shown on the archive document; convoy information for some of these can be found within the Voyage Record above. On July 27-1942, I have her in Convoy HX 200 from Halifax, which arrived Liverpool on Aug. 7. Acanthus, Montbretia and Potentilla are named among the escorts. A few days later, Gallia joined the westbound Convoy ON 121*, with B. P. Newton, Carmelfjell, Idefjord, Lista, Norfalk and Norfjell. This convoy left Liverpool on Aug. 12 and dispersed Aug. 27, Gallia arriving New York on the 28th. Again, see Page 3 for info on her subsequent voyages, with convoy information within the Voyage Record above. On Oct. 1, we find her in Convoy HX 210 from New York, for which the Norwgeian Montevideo served as the Commodore Vessel. Gallia was bound for Stanlow with a cargo of gasoline in station 43, and arrived that destination on Oct. 20. She headed back to New York already on Oct. 24, Convoy ON 141*, arriving New York Nov. 10. Anna Odland, Albert L. Ellsworth, Aun, Fagerfjell, Fernmoor, Fernwood, Herbrand, Jenny (returned), Pan Aruba, Reinholt, Salamis, Samuel Bakke (Commodore Vessel), Skiensfjord, Trondheim and Ørnefjell are also listed. Christmas that year was celebrated while in Convoy HX 219, leaving New York on Dec. 13, arriving Liverpool on the 29th. Gallia was bound for Manchester with aviation fuel, station 82. See also Page 4. She returned to the U.S. early in Jan.-1943 with Convoy ON 159, station 91 - the Commodore's narrative is also available for this convoy, for which the Norwegian Laurits Swenson served as the Commodore's ship. At the end of that month, Gallia can be found among the ships in Convoy HX 225 from New York, cargo of aviation fuel for Avonmouth, station 73,with arrival Febr. 15. Together with Brajara, Brimanger, Egda, Heranger, Lynghaug, Maud (returned), Meline, Morgenen, Reinholt, Slemmestad and Tigre, she now joined the westbound Convoy ON 168*, originating in Liverpool on Febr. 21, dispersed March 12, Gallia arriving New York March 15. Again, see Page 4 and the Voyage Record for details on her subsequent movements. The following month, she's listed in Convoy HX 234 from New York, again with Laurits Swenson as Commodore Vessel. The Commodore's report is also available. Gallia arrived Avonmouth on Apr. 30, later joining the westbound Convoy ON 182*, which originated in Liverpool on May 6, arrived New York May 22, and also had Dageid, Fernwood, Germa, Hiram, Ivaran, Oregon Epress, Skiensfjord, Thorshov, Thorshøvdi and Villanger in its ranks. Just a few days later, Gallia appears in Convoy HX 241, leaving New York on May 25, arriving Liverpool on June 10. Gallia stopped at Belfast Lough that day; she had station 72 of the convoy and her destination is given as Swansea, where she arrived June 11. She headed back across the Atlantic with Convoy ON 189* (from Liverpool June 16, to New York July 1). Acanthus, Potentilla and Rose are named among the escorts (see ON convoy escorts), and Glarona, Kong Sverre, Roald Amundsen, Solsten, Solør and Troubadour are also listed. A week after arrival New York, Gallia joined Convoy HX 247 - her destination is given as Stanlow, where she arrived July 22/23 (Page 4). She now joined the westbound Convoy ON 195*, departing Liverpool July 31, arriving New York Aug. 13. Abraham Lincoln (Commodore Vessel), Bajamar, Bañaderos, Christian Michelsen, Duala, Egerø, Vav, Velma and Washington Express are also named. On Aug. 20, she's listed in station 113 of Convoy HX 253 from New York, destination Avonmouth, with arrival Sept. 3 - see Page 5. Wasting no time, she subsequently joined the westbound Convoy ON 201*, which started out in Liverpool on Sept. 9 and arrived New York on the 24th, and also included Chr. Th. Boe, Evita, Heranger, Tai Shan, Toledo and Velma. According to Arnold Hague, she went back to the U.K. in Convoy HX 262*, which left New York on Oct. 18 and arrived Liverpool Nov. 2; Gallia, cargo of aviation gas, station 103, arrived Avonmouth that day, and shortly thereafter, she can be found in the westbound Convoy ON 210*, originating in Liverpool on Nov. 6, arriving New York Nov. 23. Both these convoys also had other Norwegian ships, namely California Express, Fjordaas, Strinda (returned following a collision) and Trondheim in HX 262, and Buenos Aires, California Express (Commodore Vessel), Duala, Heranger, Marit II, Pan Scandia and Vinga in the ON convoy. From the U.S., Gallia now headed to the Meditarranean, as can be seen on Page 5 and in the above Voyage Record. Skipping now to March-1944, when I have her in Convoy GUS 33, which departed Port Said on March 5 and arrived Hampton Roads on Apr. 4. Gallia was not present from Port Said, but joined from Bizerta, arriving New York (via Casablanca March 17) on Apr. 3. She was scheduled for the New York-U.K. Convoy HX 286 a couple of days later (Acanthus and Eglantine were among the escorts, see HX convoy escorts), but instead joined the next convoy on Apr. 12, HX 287, and arrived Avonmouth on Apr. 26. She subsequently returned to New York with Convoy ON 235*, which originated in Liverpool on May 4 and arrived New York on the 18th (Gallia joined from Belfast Lough). Germa, Ivaran, Katy, Marit II and Reinholt (Commodore Vessel) are also listed. From the U.S., she later headed back to Casablanca, where she arrived June 18 - see Page 5, as well as Hague's Voyage Record above. A. Hague has included her in Convoy KMS 54(G)* a couple of days later, voyage Casablanca to Gibraltar, having sailed from Casablanca on June 21. For info, this convoy had originated in Liverpool as the combined Convoy OS 80/KMS 54 on June 11 and split up on June 21, with the Gibraltar bound ships arriving there on June 23 (while the OS convoy proceeded to Freetown), but as already indicated, Gallia was not present from the U.K. From Gibraltar, she's said to have continued to Augusta that same day, arriving June 27 (Convoy KMS 54* - Anatina, Garonne and President de Vogue are also listed, but not with the same voyage information). It'll be noticed, when going back to Page 5 of the archive documents, that this stop at Gibraltar is not mentioned there. From Augusta, she made a voyage to Naples at the beginning of July, then returned to Augusta, proceeding to Algiers in Convoy MKS 55*. Buccinum, Falkefjell, President de Vogue and Thorshavn are also named in this convoy, which had originated at Port Said on July 8 and arrived Gibraltar July 20 - Gallia, however, had sailed from Augusta on July 13 and arrived Algiers on the 17th. From there, she subsequently joined Convoy GUS 46 back to the U.S., arriving New York on Aug. 8, remaining there for several weeks, before returning to Casablanca. The rest of her voyages are shown on Page 5, Page 6 and Page 7, with convoy information for some of them in the table above. As can be seen, she got to go home to Norway in Aug.-1945 (Page 7 also shows some of her 1946 voyages, up to and including most of Apr.-1946). * All the ON convoys mentioned here are available and will be added to individual pages in my Convoys section in due course, along with further details on each. In the meantime, the ships sailing them (and escorts) are named in the section listing ships in all ON convoys. The entire HX series will also be updated and completed, including the already existing convoys (some have already been updated) but for now, please see ships in all HX convoys. For the names of other ships in the KMS and MKS convoys mentioned in my narrative above, please see ships in all KMS convoys and ships in all MKS convoys. More information on all the other Norwegian ships named here is available via the alphabet index at the end of this page, or go to the Master Ship Index. Sold to Piræus in Nov.-1958 and renamed Elias (according to this external page, new owners were Marpoeza Cia. Nav. SA, Panama/Piraeus). Sold for breaking up 1961. Back to Gallia on the "Ships starting with G" page. The text on this page was compiled with the help of: "Nortraships flåte", J. R. Hegland, and misc. as mentioned within above narrative - (ref. My sources).